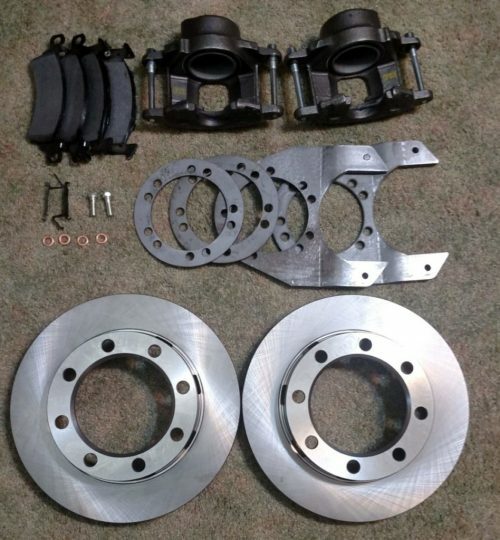 Upgrade the front OE disc brakes on your 1976 to 1997 Ford Dana 60 axle with our disc brake upgrade kit! 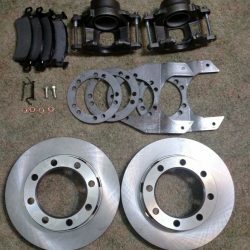 This Dana 60 axle disc brake upgrade kit is for 1976 to 1997 Ford trucks. A new and improved design, our kit now works with all known aftermarket knuckles including Crane Knuckles. This kit even works on a Ford balljoint axle up to 1997! 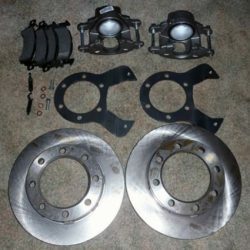 NOTE: This kit does NOT work with OEM Ford rotors. It also uses a 1/8″ spacer bracket (included) that goes between the bracket and the knuckle. (2) Standard duty JB6 3/4 ton truck brake calipers with steel pistons. Heavy-duty JB7 caliper upgrades are available.